Eco-vandal, or Friend of the Earth? My LPG-fuelled 110 V8 workhorse. Unless you have spent the last ten years on a desert island, you will have noticed that environmental pressure groups have got it in for big 4x4s. Greenpeace denounces Land Rover as 'climate criminals' and wants everyone to drive a Toyota Prius. 4x4s are portrayed as a major cause of global warming, their owners as mindless status-obsessed eco-vandals. With more and more people taking an interest in 'green' issues, it is fair to ask where old Land Rovers fit into this debate, and what can be done to minimise their environmental impact. So what are the main problems with old Landies, as perceived by the environmentalists? Basically it comes down to two: fuel consumption (and the related issue of greenhouse gas emissions), and safety of other road users. There may be other factors behind the current anti-4x4 campaign - anti-consumerism, and maybe just a bit of envy - but these are nothing to do with the big environmental issues. And anyway, if you drive a 20 year old Landie your ignorant neighbours are more likely to feel sorry for you than envy you. "Poor chap, can't even afford a nice modern car." So let's look at the really big issues. OK, I admit it. Old Land Rovers, in standard form, have really terrible fuel consumption. A 2.5 diesel Ninety might just see 25 to the gallon (although the TDi engines are rather better - 30mpg plus). Any four cylinder petrol will struggle to do 20, and the big beasts - straight six and V8 engined vehicles - can get down into single figures around town. Abysmal fuel consumption - leading to the production of huge quantities of CO2. Guilty as charged. Prime suspect for climate change crime - the Rover V8 engine. And yet... Fuel consumption isn't the whole picture. What about the energy consumed - and greenhouse gases produced - in manufacturing a new vehicle? And what about the energy used, pollutants released and rubbish created in scrapping it? It has been estimated that around 30-40% of the total greenhouse gas emissions over the life of a vehicle come from its manufacture. Scrapping creates large quantities of non-recyclable plastics, toxic heavy metals, asbestos, CFCs, PCBs and rubber products, all of which have to be disposed of. So you can argue that by keeping an old vehicle on the road instead of scrapping it and buying another one, you are helping to offset the damage done through its poorer fuel consumption. You are also helping to provide a market for components reclaimed from vehicles which really have reached the end of their useful life. On a scrap Land Rover, very little goes to waste. Any reusable component will most likely be reused. Why? Simply because there are so many old Land Rovers still on the road, which creates the demand for recycled parts. Reusing parts on other vehicles has less environmental impact than melting them down for scrap. Remember that next time you are struggling in the pouring rain to remove the back axle from a dead Landie in a breakers yard, with a giant oily Alsatian gnawing at your ankle. Here's another thing. The reason that fuel consumption and global warming are linked is that nearly all our current fuel comes from a non-renewable source: crude oil. We pump it out of the ground, refine it, burn it in vehicles, and the carbon contained within it, which has been harmlessly trapped for millions of years, combines with oxygen in the air to form carbon dioxide - a greenhouse gas. But there is another group of fuels - biofuels - which are derived from growing plants. The great thing about plants is that when growing, they absorb carbon dioxide and turn it into oxygen, trapping the carbon within their structures. You turn them into fuel, burn the fuel, the carbon is released but then reabsorbed by the new plants you are growing to replace the ones you have harvested for fuel. Old Land Rovers are mechanically simple and very easy to convert to run on biofuels - unlike modern computer-controlled vehicles which will need major modification. There are already thousands of diesel Land Rovers running on waste vegetable oil (a by-product of the catering industry). Petrol Land Rovers should be easily modified to run on the new fuel E-85 (85% ethanol) which is now starting to appear. Finally there is LPG - not a biofuel, but a very clean burning fuel, and ideal for petrol engined Land Rovers. Switching from petrol to LPG will reduce CO2 emissions by about 20%, and uses a fuel which is a by-product of natural gas extraction and might otherwise go to waste. As a short-term measure, LPG is probably the quickest way to minimise your greenhouse gas emissions. There is plenty more you can do to improve the fuel consumption of your old Land Rover. 1. Keep it well maintained. Make sure it is regularly serviced, that fuel and ignition systems are in good condition and properly set up, and that oil is clean and at the correct level, not only in the engine but also the transmission. Make sure the brakes are in good condition and not dragging, and that the tyres are correctly inflated. 2. Choose your tyres carefully. Big wide chunky off-road tyres look cool, but create lots of drag. If you use your Land Rover mainly on-road, go for a road-biased tread pattern, and avoid extra-wide tyres. The optimum sizes I have found are 235/70R16 on a short wheelbase, 235/85R16 on a long wheelbase. Unless you have specialised off-road needs, you don't need to go any bigger. 3. Avoid unnecessary weight and drag. Think carefully about the accessories you bolt to your Land Rover. Roofracks, extra lamps, snorkels, jack racks, even chequer plate, all add weight and drag, and that hurts fuel economy. Don't put your spare wheel on the bonnet, hang it at the back or (even better) put it inside the vehicle. 4. Modify for economy. Higher ratio transfer gearing (or an overdrive) will give more relaxed cruising with better fuel economy. Free wheel hubs (on Series vehicles) reduce drivetrain drag a little. The four cylinder petrol engine was designed to run on very poor quality petrol, and can be much improved for use in developed countries by fitting a higher compression gasflowed cylinder head. Finally and most drastically, if your engine needs changing, consider fitting something more modern and efficient. The Land Rover TDi turbodiesel and Ford 2.5Di (Transit engine) will both give you 30 MPG or better, as will the Perkins Prima 2.0 turbodiesel. 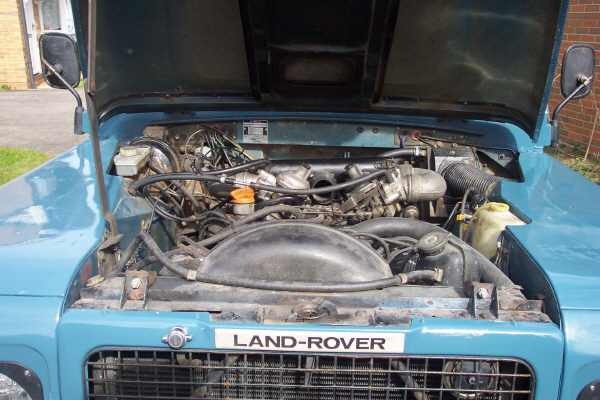 For Series Land Rovers, my own '200Di' conversion gives around 35mpg and can run on vegetable oil. An old Land Rover weighs the best part of two tonnes. It has a square front end and a big solid bumper attached to a rigid chassis. If you hit something smaller, whether it is a pedestrian or a Smart car, it is going to hurt them more than you. That, in essence, is why environmentalists object to 4x4s on safety grounds. Much of this is governed by the laws of physics, but there are a couple of things you can do to help. Firstly, avoid bolting stuff to the front of your Landie unless you actually need it. That means bullbars, A-bars, extra lights, winches, jerrycan holders, toolboxes etc. Secondly, don't speed in built up areas. In this day and age, with speed cameras proliferating everywhere, one of the really useful things about old Landies is that they are very easy to drive slowly. In a modern car, 30mph feels painfully slow. In a Land Rover, it is plenty fast enough. If you drive like a maniac you will just give the anti-4x4 people more ammunition. Slow down, relax and enjoy the ride.